SMA CENTCOM Reach-back Reports – Part 1: Messaging. Author | Editor: SMA Program Office. 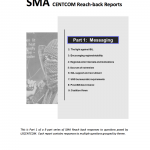 This is Part 1 of a 9 part series of SMA Reach back responses to questions posed by USCENTCOM. Each report contains responses to multiple questions grouped by theme. At the request of United States Central Command (USCENTCOM), the Joint Staff, Deputy Director for Global Operations (DDGO), jointly with other elements in the JS, Services, and U.S. Government (USG) Agencies, has established a SMA virtual reach-back cell. This initiative, based on the SMA global network of scholars and area experts, is providing USCENTCOM with population based and regional expertise in support of ongoing operations in the Iraq/Syria region. The Strategic Multi-Layer Assessment (SMA) provides planning support to Commands with complex operational imperatives requiring multi-agency, multi-disciplinary solutions that are NOT within core Service/Agency competency. 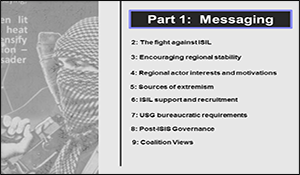 Solutions and participants are sought across USG and beyond. SMA is accepted and synchronized by Joint Staff (JS/J-3/DDGO) and executed by ASD(R&E)/EC&P/RRTO.